Central Florida has no shortage of things to do during the day but if you are looking for some evening excitement, look no further than Citywalk at Universal Orlando. Here you will find live entertainment, shopping and some fantastic places to eat. 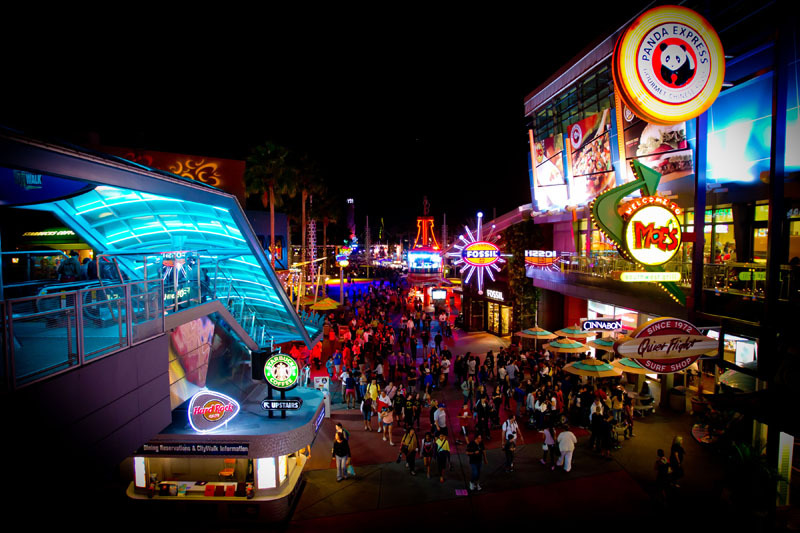 Universal CityWalk is Orlando’s hottest spot for entertainment, boasting the biggest names in live music, dining, dancing, movies and more in an eclectic mix of themed restaurants, nightclubs, specialty shops and a 20-screen movie theatre. The expansive, two-tiered promenade features individually themed shopping, entertainment and dining venues and sits at the entrance of both Universal Studios and Islands of Adventure theme parks. The 30-acre entertainment complex is a meeting place with a distinct attitude where guests can taste, touch, see and hear great entertainment. Hollywood Drive-In Golf. Photo courtesy of Universal Studios. Citywalk is great for families and for date nights. 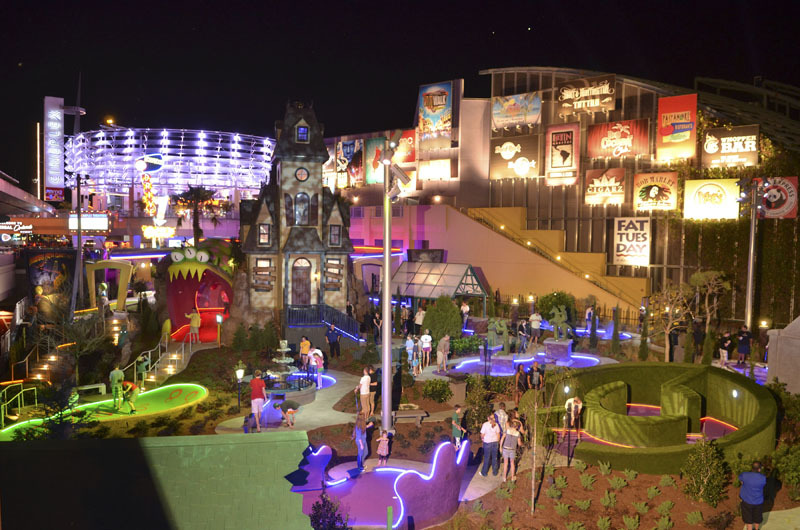 The Hollywood Drive-In Golf shown above is a fun activity for families and there are so many restaurant choices and places to shop. My children have been known to enjoy plenty of time just playing in the fountain that sits on Citywalk. 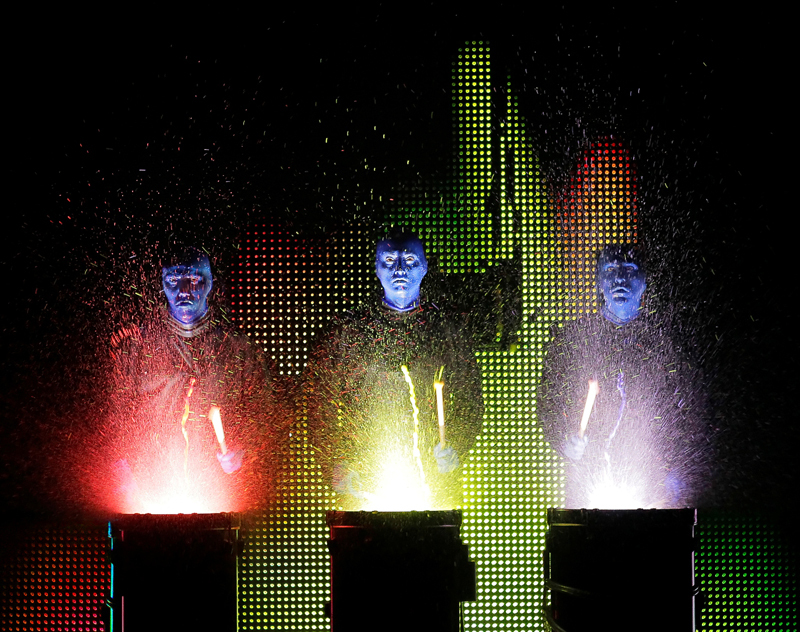 If you want to take in a show, there are live concerts and even the Blue Man Group. Blue Man Group. Photo courtesy of Universal Studios. This year there have been many new venues open up at Citywalk. The new venues include Hot Dog Hall of Fame, featuring iconic hot dog creations from some of our nation’s most famous ball parks. 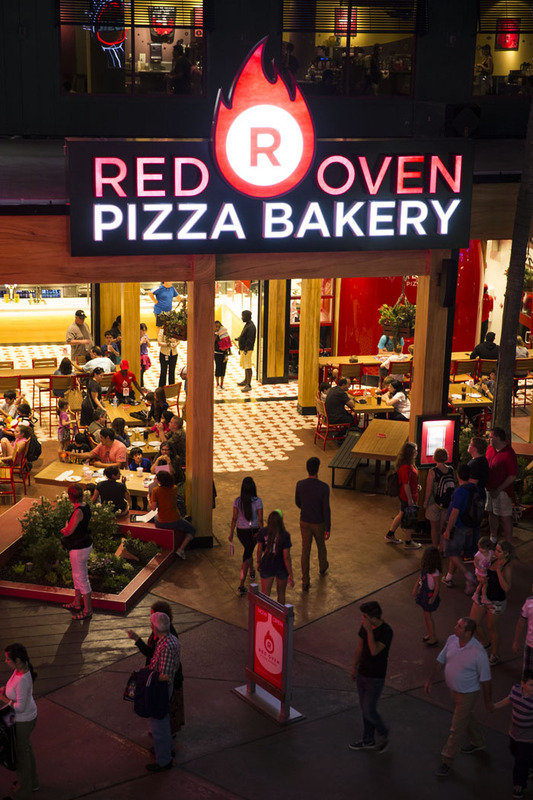 Universal partnered with Steven Schussler, the global culinary concept creator behind popular restaurants like Rain Forest Cafe, Backfire Barbecue and more, to bring his Hot Dog Hall of Fame concept to CityWalk. They also include The CowFish, an innovative and trend-setting concept out of Charlotte, North Carolina with a signature dish called “Burgushi;” and popular frozen treat spots Cold Stone Creamery and Menchie’s. Original concepts include Antojitos Authentic Mexican Food, a unique, vibrant dining experience, Bread Box, a home-style sandwich shop; VIVO Italian Kitchen, where guests can watch as the culinary team handcrafts their pasta from scratch; and Red Oven Pizza Bakery – Universal’s first-ever Neopolitan-style pizza bakery, which is now open. I recently had the opportunity to enjoy meals at Antojitos and Red Oven Pizza Bakery. 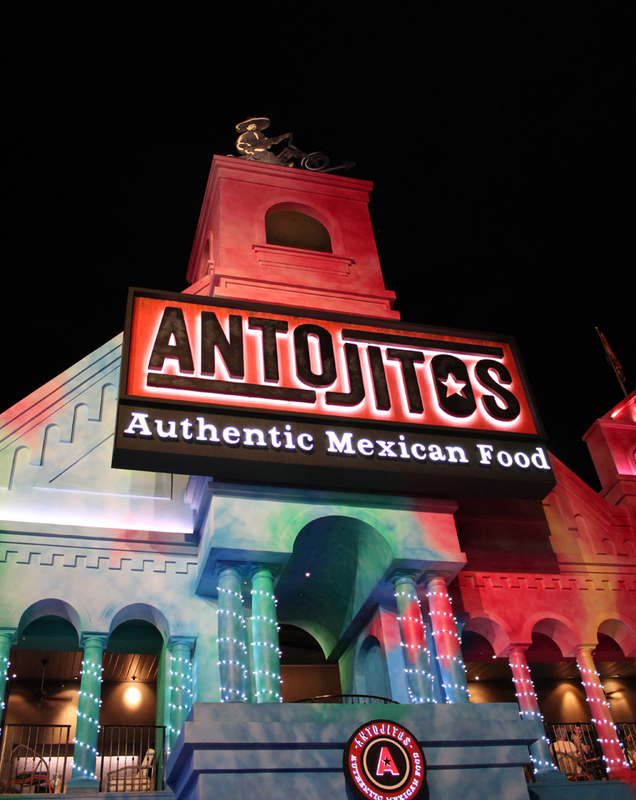 The atmosphere at Antojitos is festive and exciting. The service was excellent and the food was even better. They had an extensive cocktail menu that included several different kinds of margaritas. I tried one and it was fantastic! The pizza at the Red Oven Pizza Bakery was divine too! I will definitely be visiting both places again. CityWalk is a non-gated attraction. Cover charge for individual venues depends upon entertainment. Guests can purchase a CityWalk Party Pass for $11.99 and enjoy one night’s unlimited admission to the clubs at CityWalk. For $15, visitors can enjoy a movie at Universal Cineplex plus one night’s unlimited admission to the clubs at CityWalk. For more information please call CityWalk Guest services at 407-224-5500 or visit www.UniversalOrlando.com.